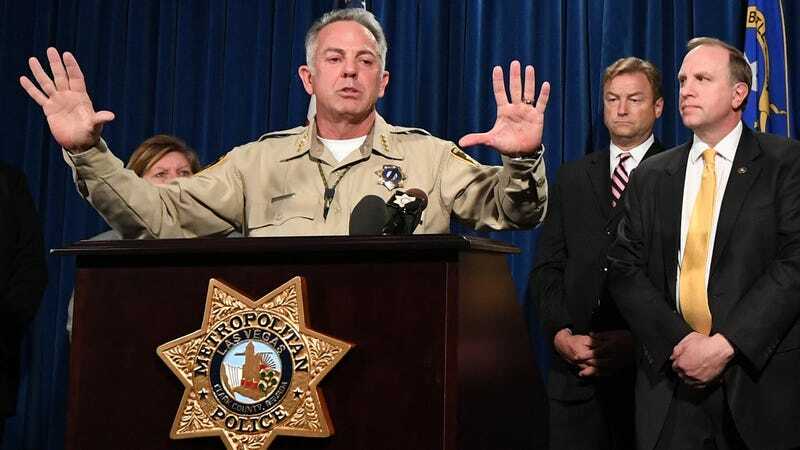 Clark County, Nev., Sheriff Joe Lombardo speaking at a press conference Oct. 4, 2017, about the mass shooting days earlier on the Las Vegas Strip. Despite the seemingly overwhelming evidence that the 2017 mass murder on the Las Vegas Strip may have been motivated by extreme-right-wing ideology, law enforcement officials still say they have no idea what caused Stephen Paddock to commit one of the deadliest mass shootings of all time. After losing a court battle to keep them private, the Las Vegas Metropolitan Police Department on Wednesday released a trove of documents from the investigation into the Oct. 1, 2017, shooting that left 58 people dead in Las Vegas. The 1,200 pages of police reports, eyewitness accounts and interviews reveal that Paddock shared some of the same narratives espoused by the right-wing nuts who believe that the government is coming to confiscate their guns and implement martial law. “Somebody has to wake up the American public and get them to arm themselves. Sometimes sacrifices have to be made,” Paddock allegedly told the man. The idea that FEMA camps would lead to martial law is a popular conspiracy among far-right groups on the internet and paramilitary militia organizations like the Three Percenters and anti-government groups like the Patriot movement. Another woman said she overheard a conversation between Paddock and another person in a restaurant about the 1990s standoffs at Waco, Texas, and Ruby Ridge in Idaho. These two events are touchstone events in right-wing, anti-government circles and the white supremacy movement. One of the more interesting stories buried in the documents concerns a man who claims that Paddock offered him $500 for each semi-automatic weapon that he could alter to fire automatically. When Paddock met the man at a sporting-goods store, the man allegedly refused Paddock’s offer and says that Paddock went on a rant about gun control and the government. Even though the evidence seems clear as to what motivated Paddock, police and FBI agents still say that they have no idea what caused him to go on the shooting spree. Claiming an “ongoing investigation,” Clark County (Nev.) Commission Chairman Steve Sisolak said that no motive has been identified. I’m sure their reluctance has nothing to do with the fact that the FBI has downplayed the dangers of right-wing extremism ever since Jeff Sessions took over the Department of Justice. If investigators declared Paddock a right-wing extremist, that would make him a terrorist and put the worst act of terrorism since 9/11 squarely at the feet of Donald Trump. By a white man, too. Not one of those Islamic fundamentalists or black identity extremists they’d have you fear. I’m sure race doesn’t factor in this at all.